1. Blend the marinade ingredients in a high-speed blender until well combined. Pour into a large mixing bowl. 2. Add all the vegie mix ingredients to the bowl. Toss together, then allow to marinate while you make the cauliflower rice. 3. Carefully pulse the cauliflower coconut rice ingredients in a food processor until the cauliflower resembles the texture of rice. Do not over-process, or the cauliflower will turn into a purée. 4. 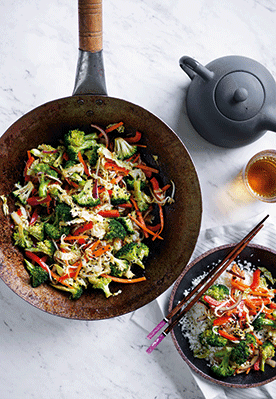 To serve, divide the coconut cauliflower rice among four bowls and top with the vegie mix. Sprinkle with the sesame seeds, garnish with coriander and serve.